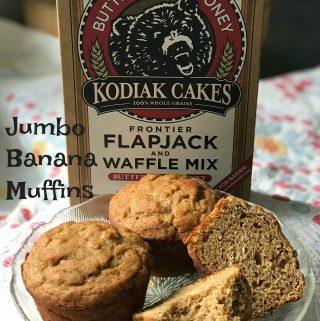 Jumbo Banana Muffins are made with Kodiak Cakes Frontier Flapjack and Waffle Mix, Buttermilk and Honey. The recipe I used was located on the back of the box. I’ve never made muffins with a waffle mix before so this recipe peaked my interest. I had several baggies with over-ripe bananas in my freezer, per usual, so I thought what the heck! I will be starting a diet in February. I know what most of you are thinking…right, sure you are. Well I am, seriously. Why didn’t I start in January like the rest of the free world? I wanted to take the month of January to prepare myself, mentally and to ready my home. By that I mean, I needed to psych myself up first and to go through my pantry, baking pantry, three freezers and any other places I might have hidden a candy bar, m & m’s or Hershey’s kisses. I also have several posts in draft form that aren’t diet friendly. I didn’t want to say I was starting a diet and then post a recipe for Cherry Kuchen with whipped cream on top. Today’s recipe features a fairly new to me product that I purchased at Target. Kodiak Cakes. Kodak Cakes has a very interesting and successful story. One summer day in 1982 when Penny Clark decided to mix together the ingredients for her father’s flapjack recipe to sell to eager friends and neighbors. She packed the mixes in brown paper lunch sacks, placed them in her eight-year-old son’s red wagon and sent home off into the neighborhood. In no time he, he returned home with an empty wagon having sold every mix. Kodiak Cakes is a true American success story. Taking a product and turning it into a profitable business. Kodiak Cakes was featured on Shark Tank, and the rest they say is history. You can’t be successful though, unless you have a fantastic product to sell and Kodiak Cakes products are fantastic. Kodiak Cakes Buttermilk and Honey Flapjack and Waffle Mix makes delicious flapjacks and waffles but it also makes a mean banana muffin. 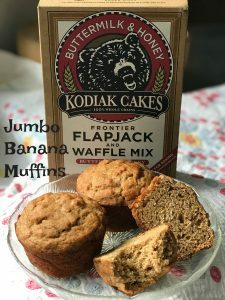 These super large, jumbo banana muffins are made with a new and fantastic product; Kodiak Cakes Frontier Flapjack and Waffle Mix, Buttermilk and Honey. Combine all ingredients in a large mixing bowl and blend until smooth. Fill greased muffin cups 3/4 full. Bake at 350 for 18-22 minutes or until a toothpick inserted in muffin comes out clean and muffins are golden brown. Recipe makes 12 jumbo muffins. Muffins freeze well.